Prices Exclude VAT Archicad Pricing in Ireland from AxonWare. 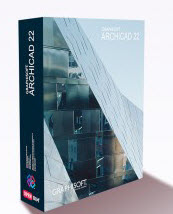 Get Archicad Solo 22 Perpetual Licen. Order Online from the leading Archicad Discount Reseller in Dublin Ph:+353-16535178. Best place to Buy Archicad. ARCHICAD Solo is a powerful BIM solution designed for a single practitioner or a small firm where collaboration or rendering are not a requirement. As you design, ARCHICAD captures all the information about your project in a central database from which the 3D model, 2D drawings, and documentation are quickly and efficiently produced. Intelligent model-based workflows for new construction, renovation, and retrofit projects provide automated, fully coordinated, and accurate documentation while eliminating costly, tedious re-work. ARCHICAD Solo provides a powerful BIM-based documentation workflow, simplifying the modelling and documentation of buildings—even when the model contains a high level of detail. It’s a full 64-bit application on both Mac and PC platforms with multi-processor support for optimum performance. Background processing, optimized scaling of multiple-core CPUs, and an improved central graphics unit result in peak performance and navigation. An introductory level Training Guide package is available to support you throughout your early experiences with ARCHICAD. Download the ARCHICAD BIM Concept interactive training guide. Teamwork (no Teamwork features available; shared files cannot be opened).